The World Heritage Centre is determined to support Solomon Islands and Australia in exploring all options to hold the responsible company, owners and insurers to account. The Director of the World Heritage Centre wrote a letter to both the shipping and charter firm South Express Ltd, the owner of the MV Solomon Trader, and the insurance firm Korea Protection and Indemnity Club (Korea P&I Club), highlighting the important role these companies have to play pending the conclusions of the liability investigations. In February 2019, an oil spill occurred near East Rennell, the only natural World Heritage site in the Pacific that is on the Danger List. Experts from Australia provided immediate assistance to the national authorities to ascertain the status of the situation and advice on possible mitigation measures to be taken. The bulk carrier MV Solomon Trader ran aground in Kangava Bay, Rennell Island, while loading bauxite ore. While the grounding and consecutive oil spill occurred just outside the World Heritage property and no oil has been reported inside the property to date, there remains concern for a possible impact on the World Heritage site and the livelihoods of the local communities. The World Heritage Centre is thankful for the ongoing support from Australia, a current member of the World Heritage Committee, and is pleased to see States Parties to the World Heritage Convention in the Pacific work together on the conservation of our common World Heritage. "It is of the utmost importance that any damage to the World Heritage property and the livelihoods of the local communities is fully covered by the responsible company, owners and insurers, and I call upon all actors involved to take up their respective and relevant responsibility pending the conclusions of the liability investigations", said Dr. Mechtild Rössler, Director of the UNESCO World Heritage Centre. An ever increasing number of companies, banks and insurance companies such as Swiss Re, Allianz and Goldman Sachs, to mention but a few, have committed to implement policies to ensure that none of their investments could damage World Heritage properties. In 2018, the world’s first insurance industry statement of commitment to protect World Heritage sites was launched. The statement was developed by UN Environment’s Principles for Sustainable Insurance Initiative (PSI), WWF and UNESCO’s World Heritage Centre. More information is available at https://www.unepfi.org/psi/. An insurance industry guide to provide practical guidance to insurers on how to prevent or reduce the risk of insuring and investing in companies or projects whose activities could damage World Heritage Sites is currently underway. In its Decision 42 COM 7.51 (2018), the World Heritage Committee welcomes the growing interest from the investment sector for the conservation of World Heritage properties and strongly encourages all banks, investment funds, the insurance industry and other relevant private and public sector companies to integrate into their sustainability policies, provisions for ensuring that they are not financing projects that may negatively impact World Heritage properties and that the companies they are investing in subscribe to the “No-go commitment”, and invites them to lodge these policies with the UNESCO World Heritage Centre. The International Council on Mining and Metals (ICMM) and its members in 2004 also subscribed to the no-go commitment. As part of this commitment, mining companies agreed not to mine or explore for mining inside World Heritage sites but also to ensure that mining operations adjacent to World Heritage properties will not impact the Outstanding Universal Value for which these properties are listed and do not put the integrity of these properties at risk. While priority lies now in assessing and mitigating the impacts of the oil spill near East Rennell, in the long run the development of sustainable livelihoods for and by the local communities is key. Logging and bauxite mining are currently one of the few sources of revenue for local communities. Development of ecotourism and small businesses that derive benefits from the conservation of the World Heritage site, the traditional knowledge of the Polynesian community and their cultural values is key for the future. In 2018, the World Heritage Committee called upon the international community to support Solomon Islands with the development of sustainable livelihoods for the local communities. 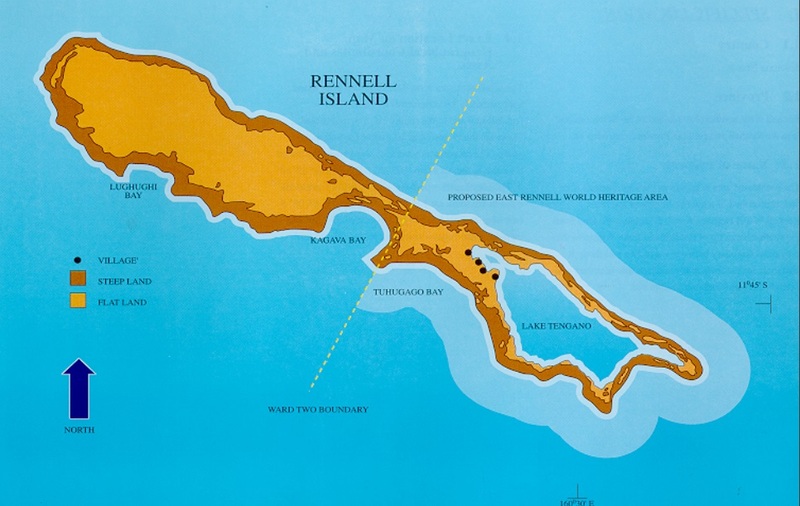 East Rennell was inscribed on the World Heritage List in 1998 and is the largest raised coral atoll in the world. The site includes Lake Tegano, a brackish lake containing many rugged limestone islets which was the former lagoon on the atoll, a diverse and unmodified forest vegetation, and a marine area extending 3 nautical miles to sea. The property was the first natural property inscribed on the World Heritage List with customary ownership and management, and approximately 1,200 people of Polynesian origin occupy four villages within the boundaries of the property, living mainly by subsistence gardening, hunting and fishing. East Rennell was inscribed on the List of World Heritage in Danger in 2013 for threats to its Outstanding Universal Value posed by commercial logging of its forests and the introduction of invasive rats. The site also suffers from over-exploitation of its marine resources of which little is known to date. A joint World Heritage Centre/IUCN Reactive Monitoring mission was already expected to visit the property in the next months, as requested by the World Heritage Committee in July 2018.